The bus picked us up outside the hotel at 9.30 am and we were off for today’s big adventure, Knossos! 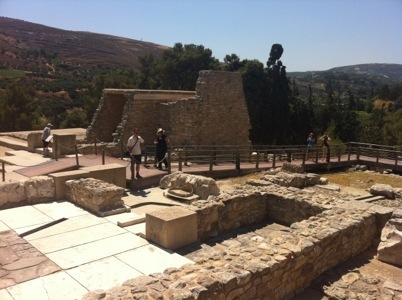 The tour of Knossos lasted 1,5 hour and without sunscreen and hat it would have been a very rough day! It was 33 degrees today and most of the time during the tour it was impossible to find a shade to hide in. 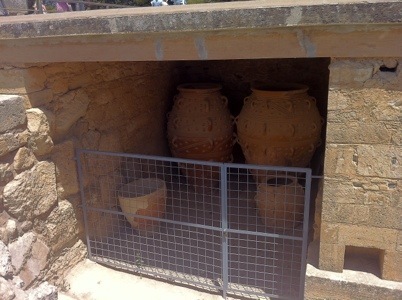 It’s a fantastic site and if you ever visit Crete you have to schedule a tour of Knossos. I only wished we had a little more time as it felt we were rushing through the site and I would have loved more time to enjoy the scenery and take pictures of this historic site. Going here privately instead of on a charter bus tour might be a better option. After Knossos we went to the city of Heraklion (Crete’s capitol, “next door” to Knossos) and had almost 3 hours there. A little bit too much for us. Aren’t that interested in shopping. A mix of Knossos with some other Crete history would have suited us much better. We spent all our time in Heraklion in a café. 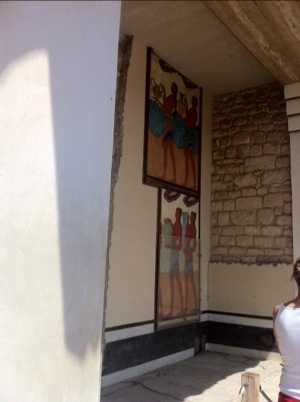 Mostly because my foot was hurting after all the walking at Knossos. When we got back to the hotel I noticed my foot was swollen. 😦 I’m hoping it will be much better tomorrow! We don’t have any plans until the evening so I can rest my foot for most of the day. Jag tyckte för några år sedan att Knossos var helt meningslöst om man inte var proffsarkeolog. Jag betraktade kanske hela Heraklions stadsmur från utsidan. Det var för mig mycket mer givande än Knossos.